Today, I headed back to school after a week's hiatus due to my Shingles. It sure is nice having kids miss you (: It was a lot of catching up in terms of wrapping up the SA2 results but it was all good. After school, I headed to Plaza Singapura for the John Little Member's Sale with the intention of buying a set of extra bedsheets for our home. However, I ended up going on a shopping spree! 4 sets of bed sheet covers (2 for my sisters! ), 2 dresses, 1 skirt, 1 muffin tin, one pizza tray, two shampoos, my mum's foundation and one set of promo plates... I spent $361! Well, it was indeed money well spent. I had a Happy Call Pot (24cm) and a 1.5litre Endo Thermal Pot FREE! I won't deny that I LOVE freebies and cheap thrills! This made me a very very happy girl. It sure is a lot of fun buying stuff for our home, a bit at a time. It was really fun making these darlings though I did absent-mindedly get burned by the hot glue gun a couple of times. 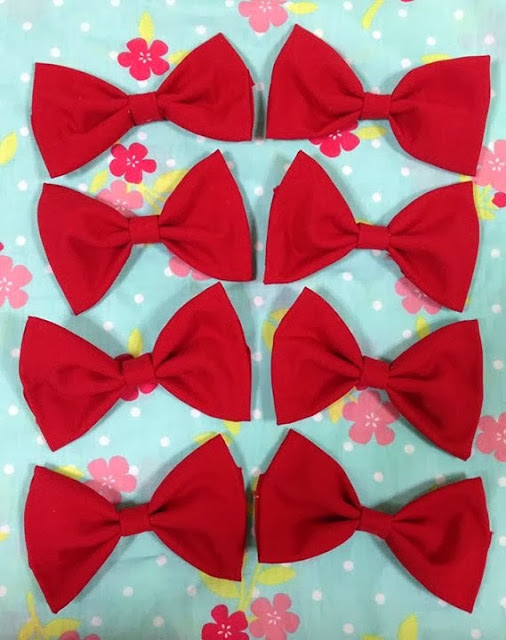 I shall share the steps to making one of these lovely little bow ties soon!